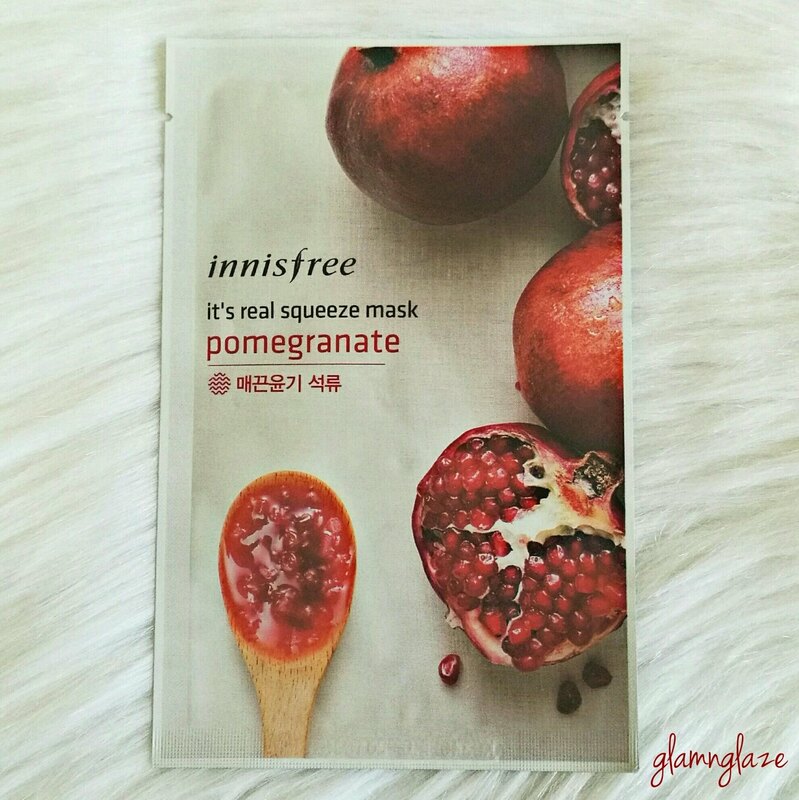 Today I am going to review the Innisfree's It's Real Squeeze Mask Sheet - Pomegranate. A firming & brightening sheet mask Formulated with Pomegranate Juice for illuminating & anti-wrinkle benefits. Remove the mask and gently pat your face to allow the remaining essence to absorb into your skin. If the product is ingested, consult a doctor. The sheet-mask is apt for people with round-face.It will be suitable for other face shapes as well.That's because it is of standard size! All the details like quantity,shelf-life,ingredients,how-to-use and warnings are mentioned on the packaging...cool! All the ingredients listed are beneficial in a way or the other.I am loving this sheet mask already! How I used the mask? Optional : after the application of the excess-serum onto your face/hands,keep it on the skin for 20-30 minutes.Wash your face with normal water.Apply a good face-moisturizer. Yes,the effect of this sheet-mask stayed for three days! Easy to use,important details are mentioned on the packaging! Brightened the skin...we all want that natural-glow...yes it helped! Nothing,but, yes the results are temporary in nature.We should apply the sheet-masks twice a week to achieve better results. The ingredients listed are very beneficial for keeping the skin healthy and radiant. I highly recommend this sheet-mask to people who have really dehydrated skin and who simply want to pamper their skin! As pomegranate juice/serum/essence is supposed to be suitable for all skin types...you must try this sheet-mask! Note : Before,purchasing any sheet-mask, do check out the ingredients.In case you are allergic to any of the ingredients...skip the product! Read the warnings mentioned on the packaging carefully. Have you used It's Real Squeeze Sheet-Mask by Innisfree? What's your take on the sheet masks? Do share.